The discipline just does not know it yet. I am continuously intrigued by the application of principles across different aspects of our lives. As people we tend to want to segment our lives and decision-making when often the exact opposite is what we need. Lessons we learn in one aspect of our life often are directly applicable to others. This article on the psychology of our personal development is a good example. You can read it here. As people we can often see how far we have come looking into the past. We see growth, we see our failures, we puff up at our successes, yet we hit a wall looking into the future. “The end of history illusion” is very real and very applicable to the far reaches of our lives. This even applies to specific professions. My intent in this article is to apply all of this thought specifically to project management. I have a number of friends who are project managers or construction managers across a number of fields. New technology, manufacturing realities, and a wavering economy are a wrecking ball to the traditional task-based, progress-tracking, Gantt-chart-toting PM. 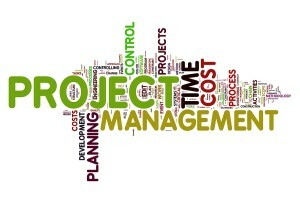 Traditional project management is based on the premise that work can be estimated. This is the foundation of projects everywhere and a natural expectation on the part of those paying for the project. The disruptive reality is that estimating is far less accurate today than it was ten years ago for many kinds of work. The pace of technological and social advancement means that we are not estimating a predictable set of acts by a predictable workforce. If we are truly honest with ourselves, I think we will see that it is impractical to try to hone estimates very closely at all. Our society is changing even more quickly than in the past. In order to encompass all the variables in an estimate today you have to increase cost and schedule estimates to astronomical heights. This has been true to a degree throughout my career, but there are fewer companies/people today who are willing to pay a premium for something to be built predictably. Advancements in materials are impacting every corner of our world. From LED light bulbs to durable paints to large flat screens you can lift with a couple of fingers, things are different every single quarter. The changes blow gaping holes in traditional practices and understandings. I would question any project that is not impacted by new and challenging technologies. We cannot live in the past. This specifically damages estimating, the idea that you can predict what will happen next is preposterous. Large scale manufacturing at a component level has severely declined in the US. Sure, we assemble parts manufactured in other countries into a finished product, but we are turning raw materials into finished goods at far lower rates than in the past. This impacts the choices and the quality of materials dramatically. Products at the quality level we need for certain applications are 3x or 5x what they are for the common part. A simple explanation can be seen in the steel industry. First Japanese steel starting eroding the American steel industry. It was well known and accepted that the quality was different. Now, our steel industry is almost gone and most steel comes from China. If you need very specialized steel with certain properties it is extremely expensive. In the past, it was only marginally more expensive because it was manufactured up the road, not around the world. On the other end of the spectrum, cottage manufacturing is on the verge of booming with advancements in 3d printing et al. These techs yield highly specialized parts at low production numbers for a fraction of the traditional cost. How can traditional approaches adapt to these conflicting realities? I believe the Agile processes pioneered in the software industry hold the answer. Many of these concepts are also defined in Total Quality Management systems and the Baldrige Continuous Improvement model. Unfortunately, none of these and the iterative cycle they promote have ever really been adopted across the project management industry. The barrier to doing so is the simple fact that many project managers are not deep experts of their industry, they simply manage schedules and compile information provided by others. As a group, project managers need to engage in their profession. I believe that project managers in the future will need to have a greater understanding and take a larger role in the active delivery of complex projects. I am excited for the changes that are coming. For those that embrace the change occurring around them the future is quite bright. For those that want to cling to the past, they will find themselves on the outside looking in at projects they do not understand. To bring this full circle we need to visualize where our particular industry will be in ten years and build those skills. I would have expected people to realize the importance of this looking back at the impact of computers etc. I guess “The end of history” illusion is powerful in all aspects of our lives.